On April 13, 1965 the Green Bay Packers, looking to improve an aging corps of receivers, traded LB Dan Currie to the Los Angeles Rams for WR Carroll Dale. Green Bay, under Head Coach/GM Vince Lombardi, won back-to-back NFL Championships in 1961 and ’62 but failed to win the Western Conference in 1963 and ’64. The club was still fundamentally strong but was in need of some retooling, and the receiving corps was one of the areas of concern. The duo of flanker Boyd Dowler and split end Max McGee was a good one and had been together since 1959 when Dowler broke in with a Rookie of the Year season. While Dowler was still in his prime at age 27 and had led the team with 45 catches for 623 yards in ’64, the nine-year pro McGee, at 32, was effective but showing signs of wear. His reception totals had steadily dropped since a career-high 51 in 1961 and he ended up pulling in 31 passes for 592 yards, although for a healthy 19.1-yard average and team-leading six touchdowns. 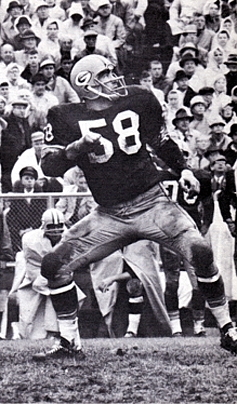 In addition, TE Ron Kramer, an outstanding blocker as well as receiver, had played out his option and was demanding a trade – he was accommodated by being shipped off to the rival Detroit Lions. The Packers had first sought to address the issue by picking Baylor end Larry Elkins in the first round of the ’64 draft, but he signed with the AFL’s Houston Oilers instead (he lasted two injury-plagued seasons and caught a total of 24 passes). “We lost our first draft choice and, as a result, we needed a receiver with speed,” explained Lombardi. The 6’1”, 197-pound Carroll Dale was just short of his 27th birthday at the time of the trade and had been with the Rams for five years, who had drafted him in the eighth round out of Virginia Tech in 1960. He moved into the starting lineup at tight end as a rookie but was shifted to flanker in 1963 and, overall, caught 149 passes for 2663 yards (17.9 avg.) and 17 touchdowns. As for the Rams, Head Coach Harland Svare was looking to upgrade the linebacker corps (Svare was himself a former NFL linebacker). While the defensive line was outstanding and contained ends Deacon Jones and Lamar Lundy and tackles Merlin Olsen and Rosey Grier, the rest of the platoon was spotty. The team had not posted a winning record since 1958 and was coming off of a 5-7-2 campaign in ’64. 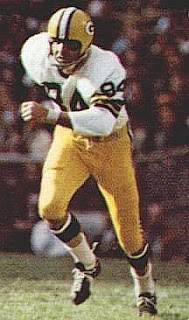 Swinging the deal with Green Bay meant sacrificing the only veteran outside receiver left on the roster since LA had also recently traded split end Jim “Red” Phillips to Minnesota, along with DT Gary Larsen (the Rams received Minnesota’s top draft choice, WR Jack Snow, in return. Veteran flanker Tommy McDonald was obtained from the Cowboys later in the offseason). Dan Currie, just short of 30 at the time of the deal, was taken by the Packers in the first round in 1958 after an outstanding college career at Michigan State. 6’3” and 240 pounds, he had starred in Green Bay for seven years and received All-Pro honors in 1962. However, he had been made expendable by the presence of younger linebackers Lee Roy Caffey and Dave Robinson, plus second-year backup Tommy Crutcher and rookie Bill Curry from Georgia Tech (who would be shifted to center). Things started slowly for Dale in Green Bay, as he gradually took on McGee’s role and caught 20 passes for 382 yards (19.2 avg.) and two touchdowns. Dowler was still the top receiver (44 catches, 610 yards) while young TE Marv Fleming struggled and was supplanted by veteran Bill Anderson. The Packers were back on top at the end, however, beating Cleveland for the NFL title. In the postseason, Dale caught three passes for 63 yards in the overtime Western Conference playoff win over the Colts and started off the scoring in the NFL Championship game with a 47-yard touchdown reception. Dale had a better year in 1966, forcing McGee to the bench and making big plays as the team’s top deep receiver. He ended up with 37 receptions for 876 yards (23.7 avg.) and seven TDs. He again had a touchdown in the league title game and in the first Super Bowl, against the AFL Champion Kansas City Chiefs, he pulled in 4 passes for 59 yards (McGee came off the bench when Dowler went down with an injury early in the contest and had an outstanding performance). In all, Dale played eight seasons in Green Bay, experiencing one more championship before Lombardi left and the club faded from contention. He remained an important part of the offense and was selected to the Pro Bowl three straight times, from 1968 to ’70. Dale had his most receiving yards (879) in 1969 and a career high in catches (49) in 1970 and ended up with 275 receptions for 5422 yards (19.7 avg.) and 35 touchdowns as a Packer. He finished up with the Vikings in 1973 and appeared in one last Super Bowl. As for Dan Currie in Los Angeles, he started at right outside linebacker in 1965 but appeared to be in decline. Following another losing season (4-10), Svare was replaced as head coach by George Allen, who revamped the linebacker corps by obtaining more veteran talent. Currie lost his starting job to Pro Bowl OLB Maxie Baughan, obtained from the Eagles. It was his final season. As a footnote, the rookie Jack Snow and veteran Tommy McDonald performed admirably for the Rams in ‘65. Snow caught 38 passes for 559 yards on his way to a productive 11-year career in LA. McDonald made the Pro Bowl with a career-high 67 catches for 1036 yards and nine TDs.